Micah Richards came through the youth ranks at Manchester City and established himself as the club’s first choice right-back. He is an FA Cup and Premier League winner with 12 England caps currently enjoying a resurgence of form at Aston Villa following a loan spell at Italian side, Fiorentina last season. He has been capped by England on 12 occasions. To build an official website to enhance Micah’s growing profile within professional football by giving him more freedom of expression and the capacity to manage his own brand. 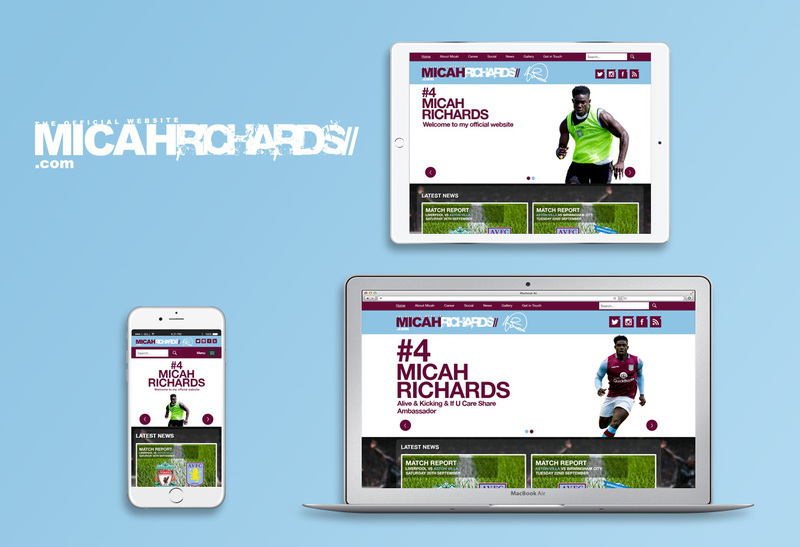 The site’s design also had to create a buzz with football fans by offering Micah a social media platform to converse and develop relationships with fans through sharing experiences and information. The site also had to cater to the needs of multi-platform journalists by offering them relevant sound-bites, quotes and news. This allows Micah and his team to media manage while at the same time promoting his website to local and national audiences. Webpraxis went for a modern, mobile-friendly website designed around the Aston Villa club colours. Incorporating news, blogs, video and imagery the site allows Micah to promote a number of charitable initiatives in the UK and abroad. Importantly the back-end of the site was designed to be user friendly to allow Micah’s team direct access to it 24/7 in order to move the story on and react within seconds to any breaking news. The construction of a blog was to provide fans with a portal into the trappings of Micah’s mind and an exclusive view into the inner sanctum of a top premier league football club. Micah’s popularity and image continues to be strengthened through his ability to converse with his myriad of followers directly through the site. And Brand Richards is showing no signs of slowing down. With his footballing powers building towards their peak, the internet savvy footballer has already established a following of over 250,000 people on twitter (@micahrichards), and over 1.2 million on his official PFA Facebook page*. WebPraxis provide ongoing support and maintenance for the site as well as consultancy.